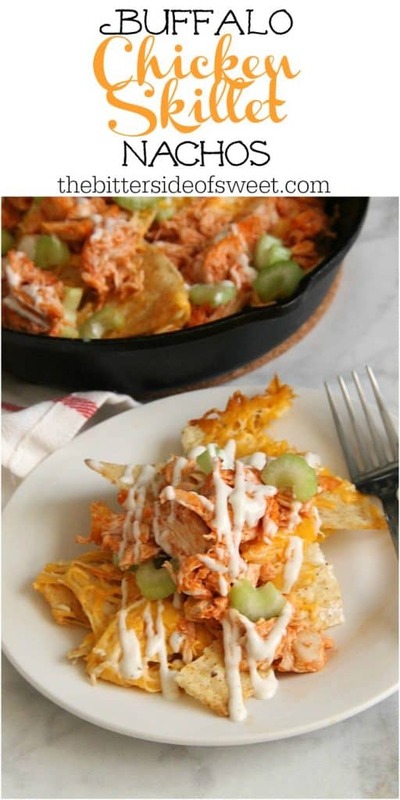 Easy to make Buffalo Chicken Skillet Nachos. 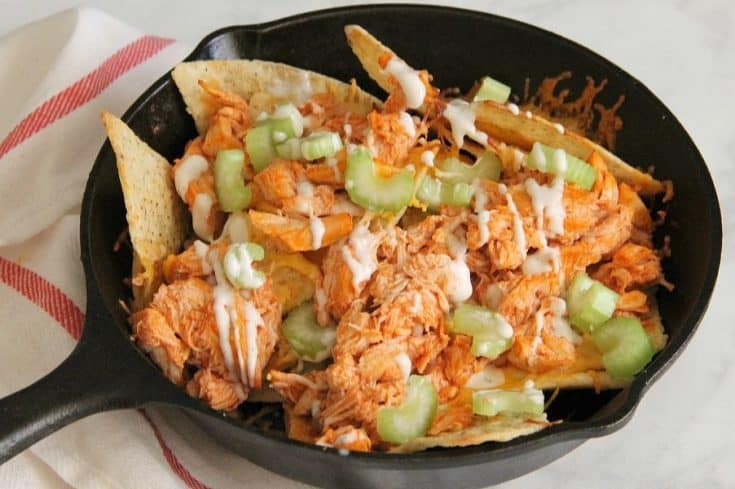 Made with rotisserie chicken and buffalo sauce, this will become your new game day appetizer! I’ve got the munchies! I absolutely LOVE to each chips and salsa but there comes a time when a girl needs to kick it up a notch! That’s where this nacho recipe comes into play! Awhile ago I made these bacon ranch skillet nachos and my family went crazy for them! So this time I decided to add some of my favorite flavors! I like to use restaurant style tortilla chips but you could definitely use any kind your would like. 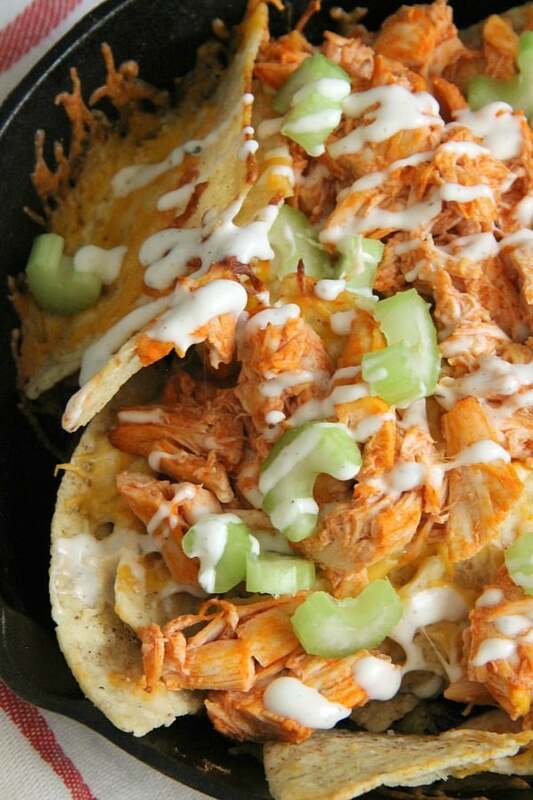 Using rotisserie chicken really speeds up the process of making these nachos. Basically you throw everything together and pop it into the oven. I went heavy on the buffalo sauce but you could cut back if you are not into anything that is too spicy. 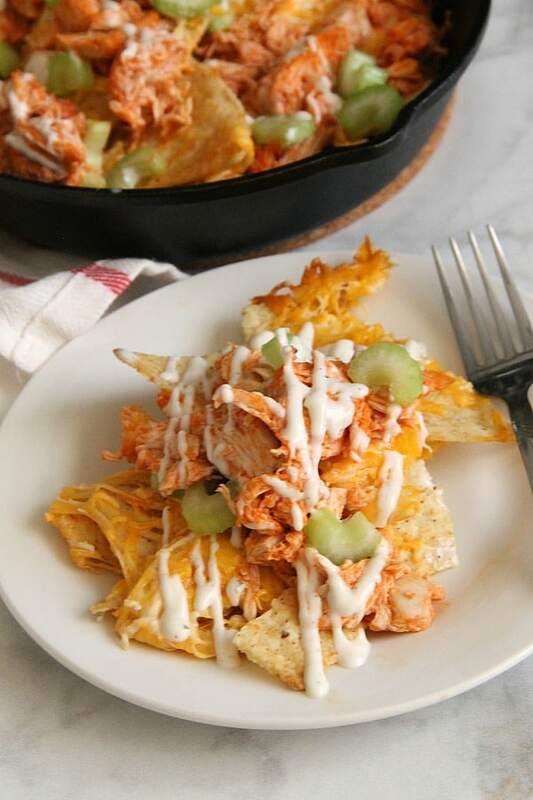 Using a mixture of cheeses makes these buffalo chicken skillet nachos super cheesy. I really like a colby jack mixture. My skillet is the small size. Which is 6 inch but you could use any size. You would just need to increase the quantities of your ingredients! 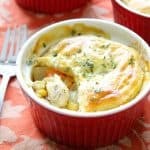 If you are looking for more game day recipes check out my archive! So many delicious recipes such as this pepperoni pizza dip! It’s incredible! 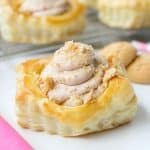 Also these bacon cheddar pinwheels are always a hit! This easy sausage dip is gobbled up quicker than anything else! 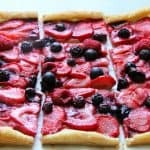 And if you are looking for something sweet, how about this mixed berry s’mores skillet dip! If you’re on Facebook come check out this fun little group I’ve got going on. Instagram is a fun resource I’m using right now. If you make an recipes make sure to tag them #bittersideofsweetrecipes so I can see your creations! 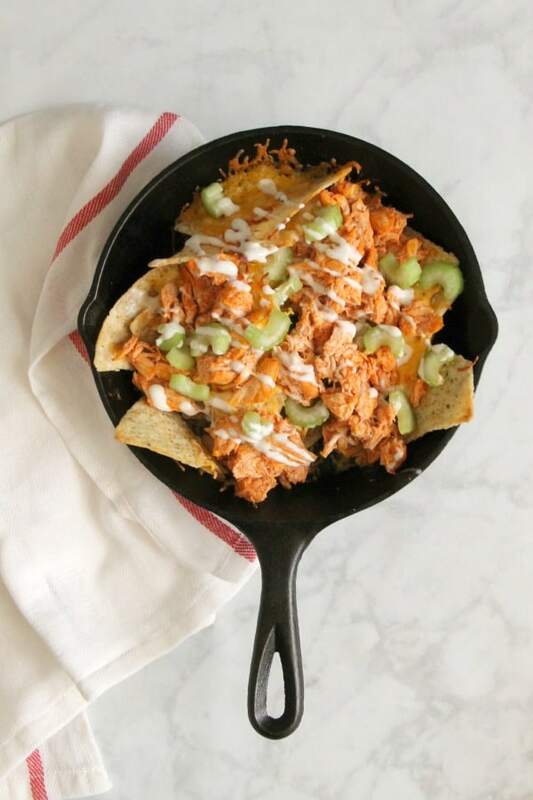 If you are looking for a few more nachos to make in your skillet, try these! S’mores Nachos, perfect way to make dessert! 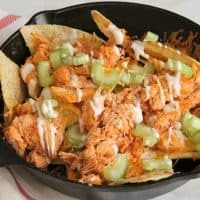 Lobster Nachos Recipe, this is going to up my nacho game for sure! Preheat oven to 375 ℉. In small bowl add chicken and buffalo sauce. Mix together well. Set aside. In small skillet add tortilla chips. 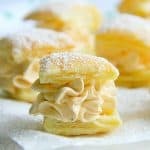 Bake for 11-13 minutes or until cheese has completely melted. Top with celery and drizzle with ranch dressing.